The Healthcare Data, Technology & Services Blog: How Can Your Healthcare Organization Do Social Media Like the Mayo Clinic? How Can Your Healthcare Organization Do Social Media Like the Mayo Clinic? Has your healthcare company been thinking about getting its employees ‘up to date’ on the benefits social media can bring to your company? Well, the esteemed social media leader and team at Mayo Clinic have been advancing leaders in the area of ‘Healthcare Social Media’ for a while now. While I’m not 100% sure, my take is that the video can be 'attributed' to a fellow named Lee Aase - someone I know was the spark that started the 'social media' a fire at the Mayo Clinic some 5, 6 or 7 years ago. This blog post is a transcript of the video – obviously produced by people well-versed in producing professional media. The narrator voice is classic! It's a short, but good, resource intended to attract those interested in learning how to use social digital media. The following is a verbatim transcript. I've done my best to add punctuation based on YouTube's voice to text translation. Social media are having a revolutionary impact in society; enabling users to share information ideas, personal messages and to create communities. Some of the most popular social media platforms include Facebook, Twitter, YouTube, LinkedIn, Pinterest & Instagram - with new sites launching continuously. Mayo Clinic’s leaders understand the power and potential of social media tools and healthcare; and also believe professionals need proper training to use them well. 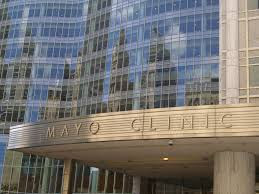 I’m proud to say that Mayo Clinic has been, and intends to be, among the leaders in using social media in medicine. This one is not about competitive advantage. This message is as it should be. It’s s all about the patient and how these tools can help us all serve them better and work together with the patients and their families for their health. That’s why we have the Mayo Clinic Social Media Network, a professional social network for Mayo Clinic employees and colleagues worldwide who want to learn and share ways to use social media tools in their work. On the Mayo Clinic Social Media Network, you’ll find social media guidelines from Mayo Clinic employees as well as an explanation for each guideline. You also have access to a unique training program in the basics of social media for healthcare professionals. Use your mayo.edu email address to create your Mayo Clinic social media account. Your Mayo Clinic Social Media account lets you participate in other Mayo social sites too, including Mayo Clinic News Network, sharing Mayo Clinic, Mayo Clinic Connect and the Social Media Champions Program. Note from @ShimCode: Mayo has a free membership option for anyone to use. As a Mayo Clinic Social Media Champion, you get access to news and health information you can easily share on Facebook, Twitter, and Linkedin. Will you make it to the top of the leader board? Review the Social Media Guidelines for Mayo Clinic Employees. Join the Mayo Clinic social media network. become a champion! That's a straight translation with punctuation I think is in the ball park. Be sure to check out the links I've provided in the above transcript and get more details about social media resources at the Mayo Clinic Social Media Network site here. Disclaimer! Why did I just Share This? Because I know that the content the Mayo Clinic provides is generally good info for those interested in health care social media. Mayo's been a leader in using social media and digital media to make a positive contribution to health care at large for a while now. And it's not rocket science. In many ways, the efforts Mayo makes on social media are becoming table stakes to compete in healthcare today. Even other healthcare providers and healthcare-related organizations not as well known and esteemed as the Mayo Clinic can do well like Mayo with some moderate focus and guidance; if leadership and staff alike are involved. For more information on how to learn about social media, digital health strategy and other healthcare data, technology and services topics, consider following me on Twitter where I share as @ShimCode. If you'd like some guidance and help with leveraging social media at your organizations, feel free to reach out to me and I can point you to some good people and resources.